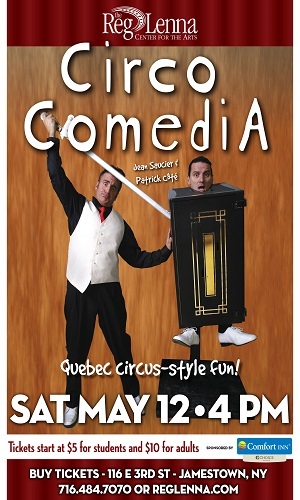 JAMESTOWN – Reg Lenna Center for The Arts will complete its 2017-18 Reg Presents season when the Quebec-based comedy duo, Circo Comedia performs live Saturday, May 12 at 4 p.m. The 2018-19 season will also be revealed prior to the performance. Unpredictable thrills, side-splitting comedy, acrobatic tricks, daring feats, magic and daredevil stunts are the signature style of Circo Comedia’s Jean Saucier and Patrick Cote. Following in the tradition of the Quebec Circus, Saucier, juggles, cycles, balances and performs magic from dizzying heights while Côté clowns, skates and drums trying his best to be the (imperfect) assistant. The duo have been performing together for nearly 15 years. Both attended the Quebec’s National Circus School. Tickets start at $5 for children aged 18 and under and $10 for adults. Prior to the performance Reg Lenna Center for The Arts’ 2018-19 season lineup will be announced. 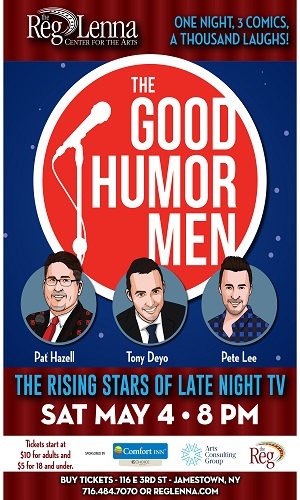 The events will include the return of a few performers from recent seasons to the stage. Audiences can expect an international drumming ensemble, an evening of standards and stories from a well-known television actor, live seasonal music just before the holidays, an afternoon of clowning from a master of the art, a high flying circus performance and three stand-up comedians who have all performed in Jamestown. Tickets for the season will go on sale June 1. The 2017-18 season has been the most successful since 2014 with half of the six performances selling out. The Reg also increased the number of movie showings over prior seasons, programming most Wednesdays and Saturdays throughout the year with the exception of a few dates around holidays and scheduled performances. Attendance at movies and live events has been just over 12,000 to date. Throughout the season, 6 of the 7 buildings that are part of the Reg Lenna Center for The Arts have been undergoing substantial renovations. A new lobby, concession area and box office will be open before the Lucille Ball Comedy Festival and the 3rd on 3rd Gallery will open in a completely restructured street level space in August. 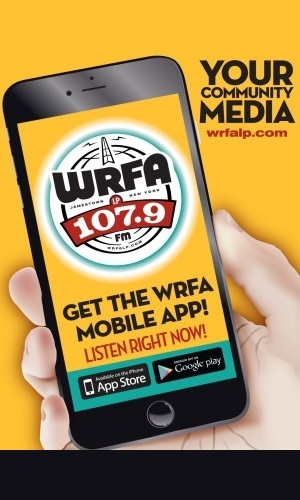 Offices for administration and both offices and studios for WRFA are on track to reopen this fall. A new multimedia arts studio and an adjacent pre-function meeting space will open to the community before the year’s end. Demolition for the multi-million dollar project began in December, 2017 with renovation and construction following in early 2018. Funding for the project comes from Western New York Regional Economic Development Council DRI, Ralph C. Sheldon Foundation, Gebbie Foundation and Lenna Foundation. Monthly public constructions tours will be offered until renovations are complete. A temporary box office location is open at 215 Spring St. (between 3rd and 2nd streets) and the entrance to the theater is next door. This box office is open between 10 a.m. and 5 p.m. Tuesday through Friday and (through May) 10 a.m. and 2 p.m. Saturday. The temporary theater entrance will be open one hour prior to movies and events, at which time tickets will be available in the box office. Tickets may be purchased at our box office locations during the times listed above, over the phone at 716.484.7070 or online at RegLenna.com.